Those in the Northeast are breaking out winter hats and mittens for the first time this season as an arctic front is moving through the I-95 corridor Friday and ushering in the coldest air of the season. Behind the arctic front, wind chills are below zero and in the single digits in Midwest. These wind chills will move into the Northeast later Friday morning and into the afternoon and night. Wind chills will be even colder, teens and single digits will be in most of the New England and I-95 corridor. 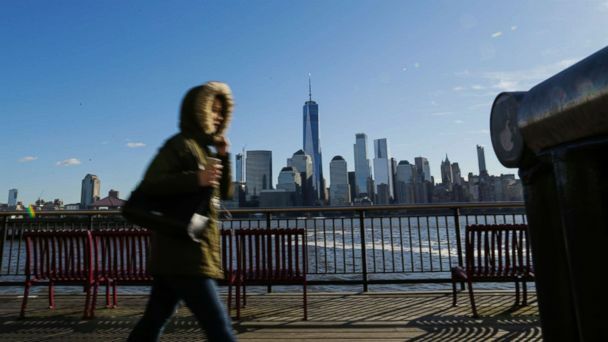 Because of the arctic air mass, the National Weather Service has issued multiple warnings and advisories for 16 states from Alabama to Michigan and east to New York. Snow will be the problem around the Great Lakes. Lake effect snow will continue around the Great Lakes from Michigan to New York and Pennsylvania, with some snow also possible in New Hampshire, Vermont and Maine. Locally, 2 to 4 inches is possible around the lakes and maybe an inch or two in western New York, Pennsylvania and New England, ABC News forecasts. A new storm system will move through the Midwest and the Great Lakes Friday night into Saturday, bringing more snow from Minnesota to Wisconsin and into Michigan. A winter storm watch has been issued for parts of the area with 5 to 9 inches of snow possible locally near the lakes.